CARACAS - After pouring billions into Venezuela over the last decade, China is cutting off new loans to the Latin American nation. It’s a major reversal of relations between the two nations, experts say. It also comes at the worst time for Venezuela, which is spiraling into an economic and humanitarian crisis. 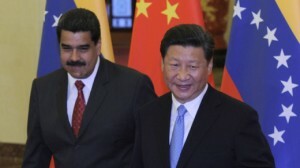 “China is not especially interested in loaning more money to Venezuela,” says Margaret Myers, a director at Inter-American Dialogue, a Washington research group that tracks loans between China and Latin America. Since 2007, China’s state banks loaned Venezuela $60 billion, according to the Inter-American Dialogue. That’s more that it loaned to any other Latin American country. China is considered Venezuela’s most important creditor. Of that, Venezuela still owes China approximately $20 billion, experts say, and there’s no sign that it can pay back the amount amid its crisis. Venezuela pays back the vast majority of its loans to China with oil shipments. Last year, Venezuela’s state-run oil company, PDVSA, shipped about 579,000 barrels of oil per day to China, according to the company’s financial audit. But this year, Venezuela — which has the world’s largest oil reserves — has seen oil production crash to a 13-year low. Some of its service providers, such as Schlumberger (SLB), have dramatically lowered operations due to unpaid bills from the Venezuelan government. Socialist president Nicolas Maduro has led a regime that mismanaged Venezuela’s resources and pushed the economy into a crisis, experts say. China has now run out of patience. China’s Foreign Ministry did not respond to a request for comment. Venezuela’s finance ministry did not respond either. Like the government, Chinese companies too are losing interest interest in Venezuela. Since 2010, Chinese companies have invested $2.5 billion a year on average in projects in Venezuela. In the first half of this year, they only invested $300 million, according to AEI. Scissors emphasizes that the data can change if China hands gives even one big loan to Venezuela before the end of the year. However, he too agrees China is in no mood to dole out more money. That souring sentiment played out last year when the China Railway Engineering Company halted construction on a “bullet train” it had been working on in Venezuela. The train’s construction sites, once a sign of blossoming relations, now sit abandoned. China long saw Venezuela as one of its top allies in Latin America, experts say. In exchange for cash and infrastructure developments, China wanted a secure source of oil for years to come. But China’s ambitions have hit the reality of the crisis in Venezuela, where inflation is expected to skyrocket 700% and the economy is projected to shrink 8% this year, according to the IMF. Its currency has plummeted in value and many experts believe Venezuela could default on its debt. With dwindling revenues, Venezuela can’t pay for many imports of food and medicine, causing massive shortages in those items. Some Venezuelans, who can, are even traveling to the United States to buy basics like toilet paper and tuna fish. Amid widespread protests for Maduro to resign, his government must now push on without China’s help.